Rent villas and apartments in Podgora, Croatia with private pools. Book affordable holiday rentals that are near a beach. On the elevated position above Podgora and below the Biokovo nature park, we have chosen for you this spacious and tastefully furnished holiday home. This traditional Dalmatian holiday home with pool is located in the nature park Biokovo, not far away from the famous Makarska Riviera. The property is completely fenced and has a pool, whirlpool. The stone walls of the house in the village Marinovici, underneath the mountains of Biokovo, offers you unique ambient with beautiful panoramic view of the sea and the place Podgora. This stone semi-detached Dalmatian holiday home is located in autochthonous Dalmatian village on a little hill and therefore is ideal for pleasant holiday with children. 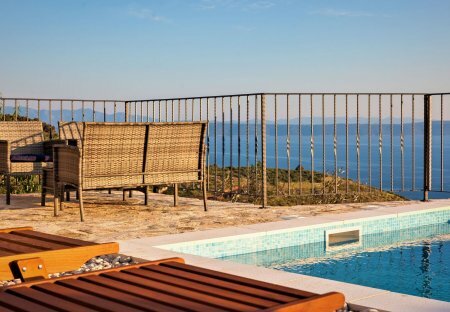 This simply and functionally furnished holiday home is located on a hilly area, above the place Podgora and in the foothill of the Biokovo mountain. Spend a pleasant summer vacation with a beautiful view of the sea and the mountain, on the uplift, above the village Podgora. The stone walls of this holiday home in the village of Sumici on Biokovo mountain create special atmosphere of past way of living. This pleasant holiday apartment on the ground floor of a family house, is located in Podgora on the popular Makarska riviera. The pretty pebble beach is only 120 m away from the unit. The stone walls of this semidetached holiday home and the beautiful view over the sea from the terrace give a special and pleasant atmosphere of the former way of life. This small stone house with holiday apartments is located by a local road in the centre of Gornja Podgora. The small village is situated at the foothill of the Biokovo mountain. This simple and beautifully furnished holiday apartment is located on the second floor of a residential building in Podgora and is suitable for the stay of smaller families. Wonderful Luxurious newly built stone villa, ideal for anyone looking for peace, privacy, comfort, beautiful nature and a stunning view.